LZS600 Type Pavement Hydraulic Cold Asphalt Recycling Equipment is a kind of multi-purpose and high efficiency construction machine. With multi-system auto control capacity, our cold recycling machine can automatically perform asphalt pavement recycling operations. 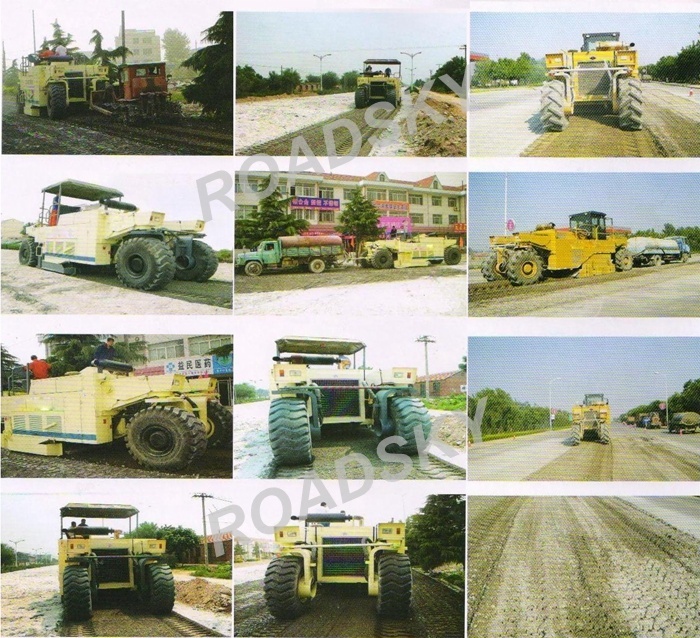 This machine has been widely used in the reconstruction of the old asphalt roads and favorable effect has been gained. Users call it "big brother" of cold recycling machines. 1) It is mainly used for the milling of old asphalt pavement and the milling-mix recycling of old asphalt pavement after adding recycling materials such as the water, asphalt and etc. 2) It can also be used for on-site mixing of the stabilized soil for subgrade and subbase of highway, urban and rural road, airport, port, parking lots, buildings and etc. 3) It is compact, flexible in usage, and designed based on advanced technologies. It has functions such as road pavement breaking, paving material milling and crushing, material mixing, and spraying of water, emulsified asphalt, cement slurry and formed asphalt recycling agent, etc. As cold recycling machines are able to achieve material mixing on-site, they require shorter construction period and lower road construction cost. By recycling asphalt material, they help save material cost during road construction and maintenance, and they can also protect the road bed well during operation. Hence, this type of road construction machinery is environmental friendly and has high working efficiency. Also, it has fast traveling speed, simple operation and convenient maintenance. 1) It adopts close type hydrualic transmission system for the traveling with stepless speed regulation. According to the change of working loads, the controller can automatically adjust the operation speed, by means of which the automatic distribution of power is realized. 2) It adopts mechanical transmission system for working devices, which is more efficient than hydrualic transmission system. It adjusts the speed of milling-mix rotor through changing the location of belt wheel. 3) Spraying system can spray water and emulsified asphalt. It consists of single-screw pump and asphalt pump which are respectively driven by two independent sets of electrically-controlled variable stroke pump and constant displacement motor. It adjusts the sprayed quantity through the controller. 4) It adopts CUMMINS 610HP powerful engine, the effect of milling-mix is favorable, operation is with high efficiency and the operation is easy. 5) With intelligent control system, self-diagnosis can realized for malfunction. 6) The hydraulic elements, control elements, reducer, transfer cases, clutch and etc. are all imported from famous company. 7) The cost can be saved 20%-46% compared to the traditional construction methods. 8) The old material can be used fully on the spot, which make the base layer strengthened, materials saved and resource protected. 9) Short construction period, which brings small affects on public transport and less disturbs. 10) Fully hydraulic drive, all wheels steering and automatic control make a better effect for the machine. 1) Adopt high-power supercharged inter-cooling engine with high efficiency of reserve and powerful drive. 2) Hydraulic systems adopt hydraulic pumps and motors with internationally famous brands. 3) Spraying system adopts hydraulic driving method. Required quantity of sprayed water is controlled by flow control valves with high precision. Accurately control the quantity of sprayed water through microcontroller and according to mixing depth, working speed. 4) Convenient mixing cutters of the type called “knock-it-in and knock-it-out” shorten the time for replacing. 5) GPS remote management system can monitor the status of the whole machine, diagnose faults and provide instructions for maintenance.